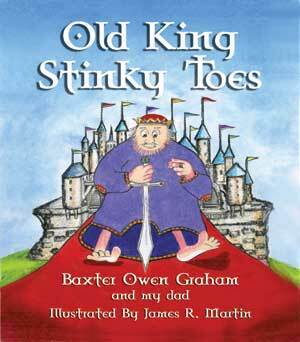 Old King Stinky Toes is based upon the real life storytelling of a father and his son. Building upon the fictional exploits of a worthy King with stinky toes too much to bear. In the end the perplexing stench and witty King demonstrates his benevolent service to his subjects. Readers beware! WARNING: THIS BOOK MAY CAUSE CHILDREN TO SAY STINKY THINGS. King Stinky Toes is good and kind King, except for one small problem. His servants make fun of him in spite of his kindheartedness, and the King is very sad. Poor King Stinky Toes. Destined for insults and mistreatment, how can Old King Stinky Toes win their respect? The answer lies in the stink itself. And the Kings character will have you and your family smiling from ear to ear. This memorable tale and the writing of it brought a father and his son to depths of laughter and imagination. Illustrator James Martin was Baxter's fourth grade elementary teacher and mentor. His fun and creative energy is distinctive and inspired. I was very impressed! With both the artwork and the story!! It’s sure to be a hit with kids and parents everywhere. The valuable message of acceptance and tolerance is artfully crafted in the “Stinky Toes” story. This fun story written in rhyme shows how something bad can be used for good. The illustrations are delightful and funny as we get close-ups of the kings stinky toes! This is a sweet story by a talented young man.